On May 2nd, 2016, a severe storm crossed over the Potomac region, affecting neighboring cities like Rockville, Potomac, and North Potomac. This severe storm brought incredible hail with it, ranging in size from quarters to golf balls. 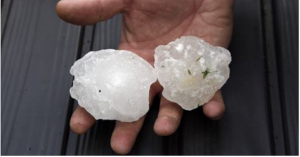 This type of hail is highly damaging to the exterior structure of your house, including your roof, siding, fascia, gutters, downspouts and windows. Due to this, we encourage all homeowners in the areas reached by the storm, to thoroughly have one on of our inspectors check their home for free. Damaged roof approved by insurance. Note that hail damage can sometimes be hard to spot, even when it was golf ball sized hail that hit. 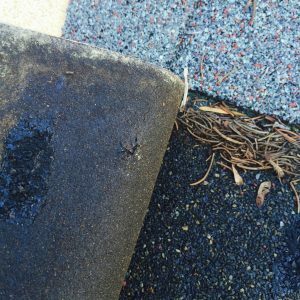 This is why you should not only rely on your own initial home inspection, but call a Haag certified expert to fully access your home as well. What you may think is normal wear and tear is actually a hail hit. The force of hail against your shingle weakens the granules. Over time, the shingle becomes torn or ripped like the one pictured below. 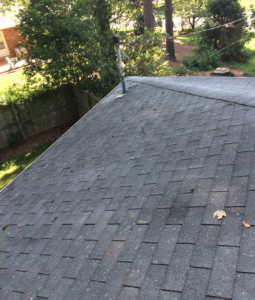 This allows water to enter the underside of your roof and eventually, leak inside. We encourage homeowners to be preventative as interior leaks from hail damage usually happen a few months after the hail storm. At this point, it may be too late to file an insurance claim for hail damage as most insurance companies only allow a 6-months to one year time frame to file following a weather event. 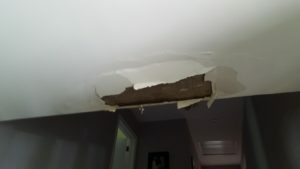 This means that you will not only have to pay to repair your interior water damage from your leaking roof but also, have to pay to repair your roof to stop further leaks, all out-of-pocket. It is always best to be certain you have no damage than to be stuck in the unfortunate situation of finding out you did have damage and now you’re unable to file an insurance claim. If you live in the Potomac or Rockville area, you would greatly benefit from a free home inspection. It takes 15-minutes and could really save your home from further damage and give you peace of mind. To learn more about hail damage or to schedule a free home inspection, give us a call today at 410-569-1732. We are happy to answer any questions you may have about storm damage insurance claims, hail damage or about our company. Modern is Haag certified, meaning we are specfically trained and certified to identify credible hail damage over aging shingles or typical wear and tear. We are also GAF Master Elite Certified, a credential only 2% of roofers nationwide are given. To read more about the storm that hit the Potomac, MD region, check out this article from the WSJ.